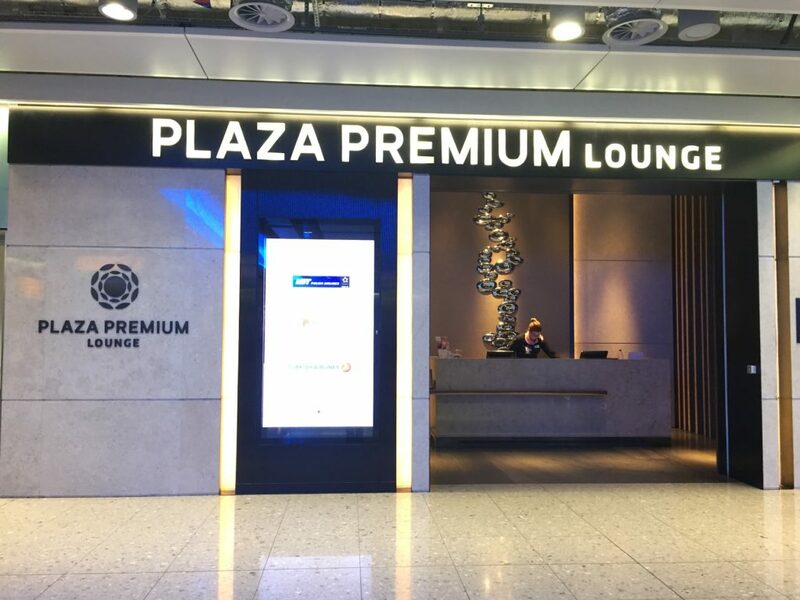 I used my membership as a Priority Pass* member to gain access to the Plaza Premium Greeted lounge at Heathrow’s Terminal 2 (departures). The lounge (which is conveniently located after customs in Terminal 2) is located on the lower level, tucked away in a quiet zone away from the main shops. As soon as you start walking towards the entrance, the hustle and bustle of everyday airport life seems to fade away. And that’s what I love about airport lounges. Following an unfortunate air incident that I experienced in 2015, I’m a nervous flyer anyway, so anything that’s going to calm my nerves before a flight (i.e. peaceful surroundings) then I’m all for. As a Priority Pass member I can check in guests for £15 each, which costs much less than if you were to book directly with the lounge, so it’s definitely worth thinking about if you’re a frequent flyer. As I was travelling with most of my family (VIP, the kids and my parents) on a multi-generational trip, I was able to sign in my five ‘guests’. 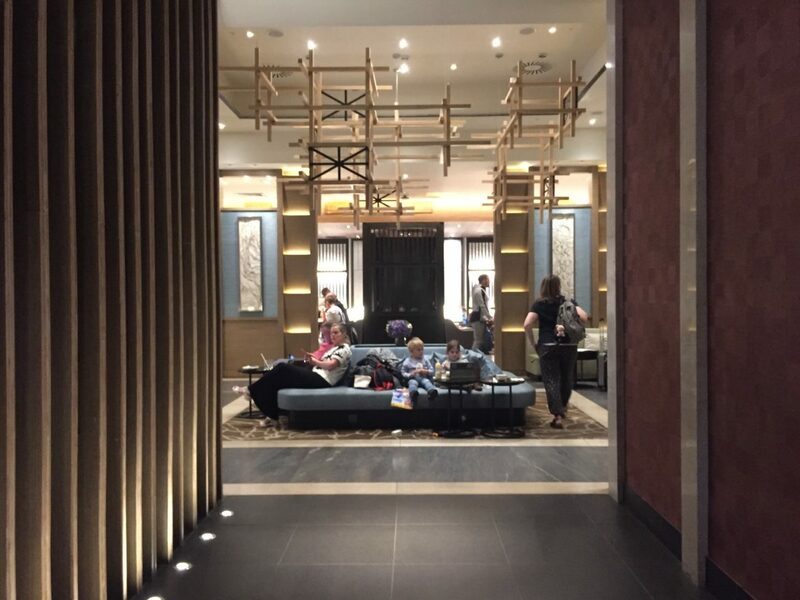 The great thing about the Plaza Premium Lounge is that it permits children to enter. Yes, I know what you’re thinking….What if you’ve escaped the kids and you’re on a nice city break without them? Do you really want to be paying to enter a lounge that permits kids who might run round and be irritating? Of course, I can’t speak for all lounges, but our experience was still a very calming one – even with the lounge at around 90% capacity. 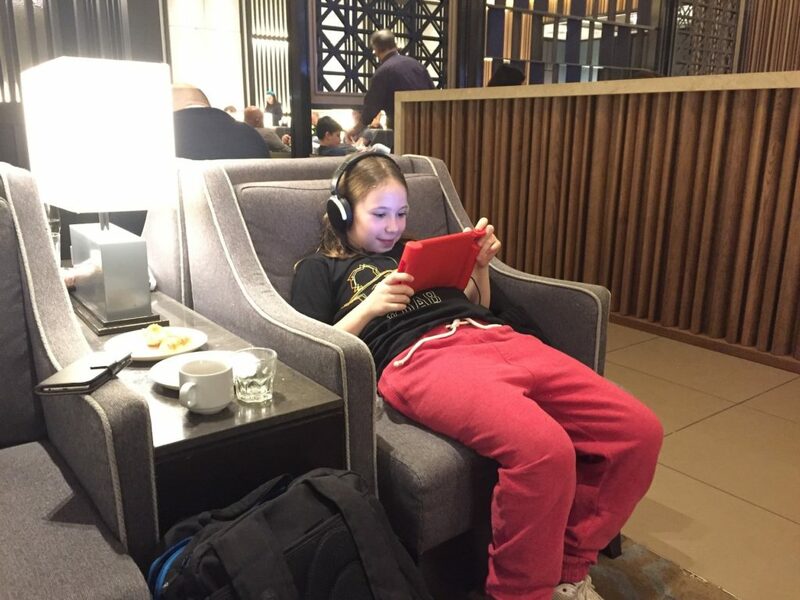 Our kids just sat in the seats and got set up on the lounge’s free Wi-Fi (the code was handed to us at check-in). Anyway, I’m glad we made use of the lounge on this occasion; even though we were at the airport at 09:00 for our midday flight, the terminal was heaving and we were unlikely to have found seating for the six of us had we not booked into the lounge. As you walk into the lounge the space opens up into a central seated area, with a bar on the left. To the right is the dining area (with table seating) and all round the dining area are armchair seats, all featuring power points. 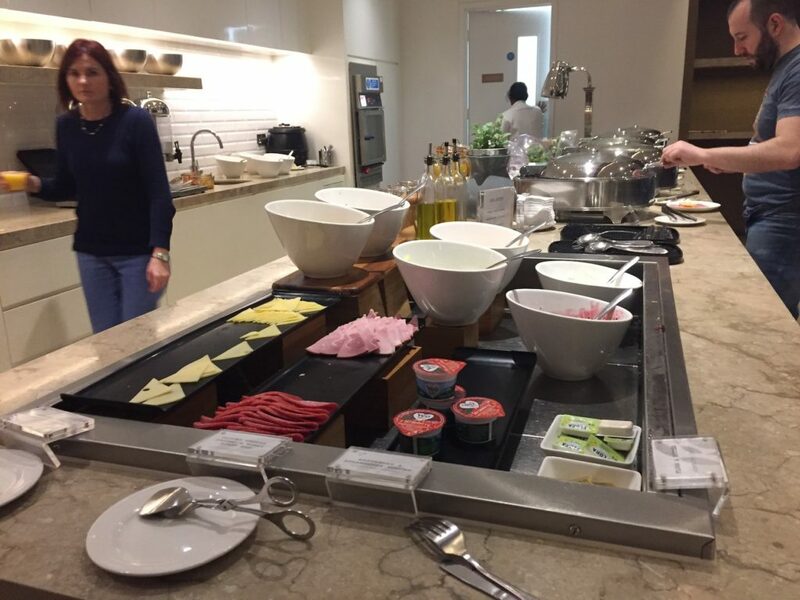 They were serving a breakfast buffet when we arrived and there was a great selection: cold meats and cheese, sausages, bacon, scrambled eggs, hash browns, baked beans, croissants, cheese and crackers plus yoghurt were all available. The drinks were also self-serve; alcoholic beverages were available from the bar (near the entrance), along with bowls of peanuts (if you asked). Fruit juices (three varieties) plus a selection of hot drinks were also available as self-serve. There was a tall fridge offering cans of Fanta, Coke, Sprite etc., but I did notice that they didn’t have bottled water. There must be a good reason for this of course (it must be down to cost as I’m sure everyone nabs a bottle of water), so I ended up going to WHSmith to get a couple of bottles for the flight. Just before we left the lounge they had cleared away the breakfast buffet and were putting out a lunch buffet. I wasn’t hungry so I didn’t eat, but I noticed they had things like cous cous, rice and chicken. My mum seemed impressed with the variety of food though. Near the seating area was a selection of newspapers. My mum picked up a newspaper and read a story about Prince Harry getting wed in secret in Las Vegas. Anyway, back to the magazines. I have to say, I wish they had more choice. There were a few niche magazines and high fashion women’s glossies, both of which I’m not particularly interested in. It would have been great to have had more light-hearted reading material there – some women’s weeklies perhaps and maybe a couple of mags for the kids; it seemed a bit thin on the ground. Again I ended up leaving to go to WHSmith to pick up a couple of mags. Had I been a bit more flush (if I’d won a small fortune on the lotto) I might have decided to sample the spa, but I didn’t. But I can tell you that it offers a selection of massages and organic treatments. What worked: The calming atmosphere, the great tasting food (and selection), free Wi-Fi and power points galore. What didn’t: I would have liked a larger selection of magazines and newspapers (at 9am we had to hunt for a newspaper to read) and a bottle of still water to take on the plane would have been great without having to fork out nearly £3 for a bottle from WHSmith. 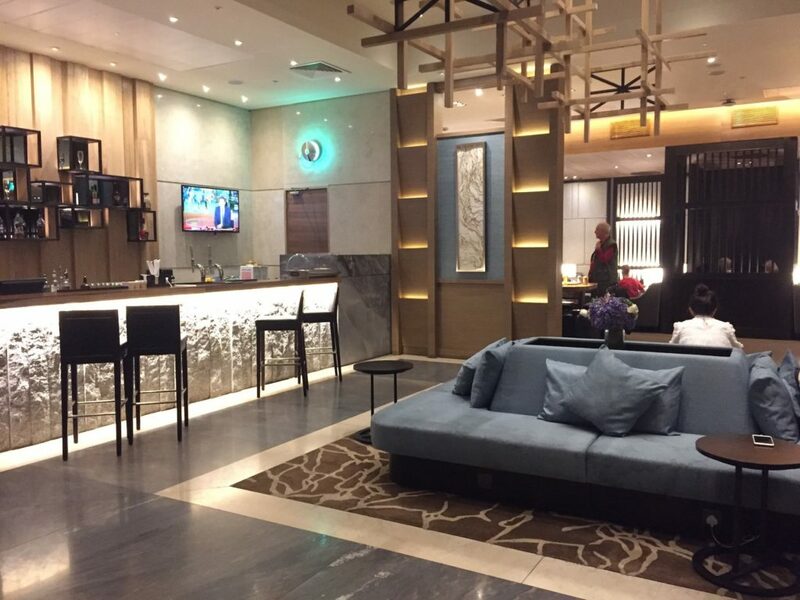 There is a Plaza Premium Lounge in both arrivals and departures. The one in departures is larger and the minimum stay (if paying on the door) is two hours which costs £35 per person. Prices for a one-hour visit are from £25, which increases by £10 for each hour you add on. The lounge accepts a variety of membership passes (such as Priority Pass) along with payment at the front desk. Being a member of Priority Pass offers access to over 1,000 airport lounges worldwide. There is a choice of three membership plans to suit travelling needs. It looks so nice a relaxed, perfect for a nervous flyer! You definitely need a spa treatment next time : ) I’ve been to the Virgin Atlantic lounge at Gatwick a few times and it’s amazing. Although I must admit, I love looking in all the duty free shops. It looks like a great place to relax before the flight. I always thought that it was only available for members. Good to know that it is open for everyone. Yes – a lot of people think that it’s only reserved for business travellers or members. Can I come with you, how great does this Lounge look. Anytime we travel I make sure to book into a Lounge for a bit of peace and quite, plus save some money so I do not spend all my money in duty free. Yes that’s true on saving money so you’re not tempted to spend it in other shops! Oh wow this looks amazing! I think I’d feel like a celebrity! It has to be done Sarah – if only the once! Sounds fantastic. I always look out for family friendly spots. Wifi is a winner! I haven’t been to an airport in years so had no idea what to expect when reading this! Oh you really just try one! Even if it’s just once! It really is Kara – it’s bliss! I never even knew this was an option, it definitely sounds like a better way to experience the airport. My eldest would love the free wifi!! It’s especially great if flights are delayed.